Hey everyone. I did NOT write this article... I outsourced it to Textbroker.com because frankly, it bored the hell out of me. The content is solid, but anytime I don't write an article, I want to make sure I disclose that. I write 99% of the content on this site but this one, not me. If you currently sell on Amazon or you plan to start, it’s important to know how the different selling options work. Amazon offers a Seller Central and a Vendor Central. While both allow you to sell products on Amazon.com, each has its own advantages and disadvantages. With Seller Central, you’re selling products through Amazon, which lists you as a third-party seller. Anyone can open a seller account with Amazon. Currently all sellers must be under the "professional" plan which costs $39.99/month. On top of this monthly payment all sellers pay various fees when their products sell and to store them in Amazon's fulfillment centers. There was a free "merchant" plan that is no longer an option. It required sellers to ship their own products without the help of Amazon's fulfillment centers. They were also charged fees for shipment (obviously, not for any storage). You have control over your own product listings with this option, including the descriptions and prices. Note: Sellers can "list against" other existing items on Amazon. If a seller wishes to list against another pre-existing listing, they cannot easily make changes to the product without the help of seller-support. There are two options when you use Seller Central – you can stock and ship products yourself, or you can have Amazon handle that when you go through its Fulfillment by Amazon (FBA) service. When you use FBA, you ship your products to Amazon, which stores those products at one of its warehouses until they’re sold. There is a small storage fee as well as FBA fees with every sale. While those fees cut into your profit margin, the advantage to this is that your products will be part of the Amazon Prime program, so members can get free two-day shipping. Customers generally prefer going with a product that has free two-day shipping instead of one that has a shipping fee and may take a week to arrive, given the choice. ​The downside of Seller Central is that customers need to check third-party seller options to see your product listings, and then you’ll be competing with all the other third-party sellers offering that product. Both of these factors reduce the likelihood of making the sale. Customers typically prefer making their purchases through Amazon instead of some random company offered in the third-party seller listings. For pre-existing listings, you could have over 100 different sellers on one item! There is no real competitive advantage except price and your seller rating. Sellers who list their own custom products (private label) have a distinct advantage here if they can get their product to rank well since they will be the only ones on the listing. 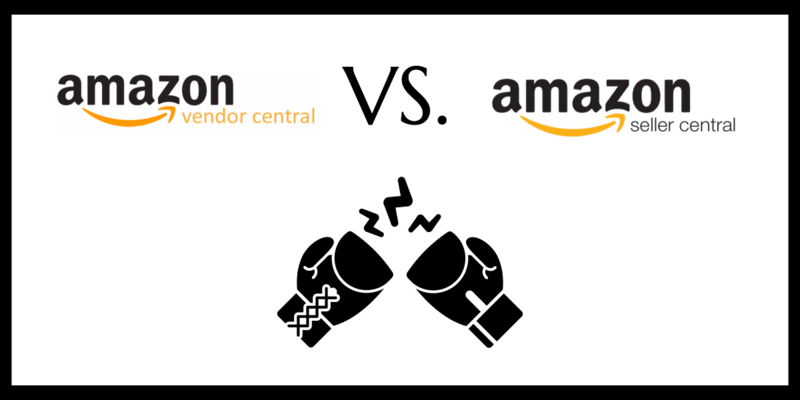 The first thing you need to know about Amazon Vendor Central is that it’s available by invitation only, which can make the choice easy for you. If you want to sell on Amazon and you haven’t received an invitation, your only option is Seller Central. How do you get an invitation to be a vendor? Amazon sends invites to sellers that move a high volume of products, so it’s all about your success as a seller. As a vendor, you’ll be selling your products to Amazon. You’re essentially the distributor and Amazon is the seller. The good news is that your products will have actual Amazon listings, not just listings on its marketplace like it would if you were a third-party seller. To the customer, it looks the same as if they were buying any other product through Amazon. This works out well for you because you’re likely to sell far more products this way. There are a couple other ways that being a vendor helps you sell more. Seller Central doesn’t allow A+ content, but Vendor Central does. A+ content is the extended product details and descriptions that Amazon products have. You can create A+ content yourself or allow Amazon to handle that, but either way, it provides a better opportunity to demonstrate the benefits of your product. Your products will also be eligible for the Amazon Vine program. This is where some of the top Amazon reviewers write reviews of your product. Since only the company’s top reviewers are part of the program, you can expect higher quality reviews that are more likely to increase sales. In exchange for the potential of higher product sales, you’re giving up some control when it comes to pricing and your inventory. Since Amazon is selling the product, it will also be setting the price. You will provide a minimum advertised price (MAP), but there’s no guarantee that Amazon will follow that. Let’s say you have a product that costs you $10 to product and you set the MAP at $19.99. Amazon decides $11.99 is a better price. There goes most of your profit margin. You’ll need to be able to ship inventory to Amazon quickly. If there is unsold merchandise, Amazon may eventually ship it back to you. While you can’t become a vendor without an invitation, assuming you have the option, you’ll need to consider your business’s current situation and goals to make your choice. When you make the jump to Amazon Vendor Central, you’re giving up a good deal of control to hopefully sell more products. You should only do this if your business is capable of selling a high volume of products. Profit margins could be narrow depending on what Amazon does to your prices, so you’ll need large sale numbers to make the arrangement worthwhile. Amazon Seller Central may not have all the bells and whistles, but you’ll have more control of your business and be less at the mercy of Amazon. You can set your own prices and resolve any customer service issues on your own. Another factor to consider is payments. Seller Central has fast payments, so you don’t need to wait long for your money after making a sale. With Vendor Central, it usually takes between 60 and 90 days for payments, which can create a cash flow problem for your business. Interested in Learning More about Selling on Amazon? Here is a quick video showing you more about getting started selling on Amazon!